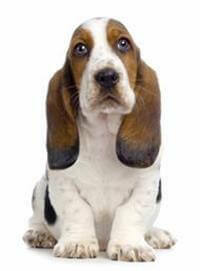 The word Basset is French and means ‘low-set’. The first detailed proof of the Basset’s existence was in 1585 where they were used as badger dogs. Their original home was the region of Artois and Flanders. Basset Hounds will normally live to ten years of age but can live up to 12 years when given lots of love and attention as well as being fed the correct diet. These dogs in top condition should be up to 18kg and 33cm for the females and 25kg and 38cm for the males. There is nothing worse than a totally unruly, uncontrollable, spoilt Basset. Remember that as these dogs mature, they need both firm and consistent training in order to teach them acceptable manners. Don’t let your Basset Hound rule the roost!